There’s a risk with successful, long-running characters that after a while they become caricatured, that there’s a shift away from nuance and depth towards something painted by far larger brush-strokes. For the first ten years or so of his media life, Alan Partridge managed to steer clear of such a progression, in part, perhaps, because as a walking cliché the line between character and caricature was already blurred to start with. However, there’s a nagging feeling that since his re-appearance in the online miniseries Midmorning Matters in 2010 (after an 8 year absence) things have changed slightly. The fault is not with the writing. The Alpha Papa script, and particularly the dialogue, by Partridge veterans Peter Bynham and Armando Iannucci and relative newcomers (2010-) Neil and Rob Gibbons, is as pinpoint and surprising as ever. He isn’t afraid to share tales of his ‘aggressive athlete’s foot’, it seems entirely natural that Alan’s ‘favourite seige’ is the Iranian Embassy one from 1980 (‘great seige’), and his description of a panic attack in a carwash is possibly the highlight of the film. Alan’s fickle and self-preserving nature is also to the fore here, never more so than when he flip-flops between cosying-up to and then back-stabbig his recently fired radio colleague Pat Farrell (Colm Meaney). 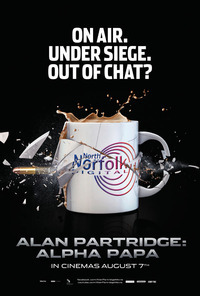 In accordance with his grand narrative, Alan’s desire to be back on television and a ‘someone’ again are at the centre of the plot, as they should be, and much of the pleasure comes from seeing how Alan positions himself in relation to the unfolding events - Farrell has taken radio station workers hostage and insisting on using Alan as the police go-between - so as to give his career a shot in the arm, without appearing exploitative. Every twist and turn is executed with the utmost fidelity to the character. Rather, the two weaknesses come from the direction, and to a lesser extent from Steve Coogan’s performance. It seems almost sacrilege to criticise the man who is Partridge to such an extent that they share baby photos (see the (auto)biography I Partridge: We Need to Talk About Alan). However, the public demand for more Alan seems to have resulted in a more knowing performance; at times Coogan’s thought process of how Alan might deliver a particular phrase, gesture or movement seem to be visible on the screen. This is a complaint that can only be levelled at tiny, individual moments, but there are occasions which feel less natural than Alan’s previous screen appearances. This is perhaps exacerbated by Declan Lowney’s direction which is functional at best and with few visual flourishes. Significantly the move to the cinema screen means a move away from the lo-fi aesthetic of the rest of the Partridge oeuvre (more of this in the Alternate Take). It’s entirely right that the jokes should lie with the characters, rather than the visual style, but at times the style doesn’t quite seem to be servicing the comedy or Coogan’s performance in the most effective way. Nevertheless, this is a film that provides Alan fans with the best of both worlds, taking the character into new areas - as has been the case with each previous instalment in the saga - whilst also acting as a greatest hits package of sorts. It’s not perfect, but it is a better big screen outing than some may have been expecting and, thankfully, it is very funny from start to finish…particularly to finish. This review was published on August 15, 2013.